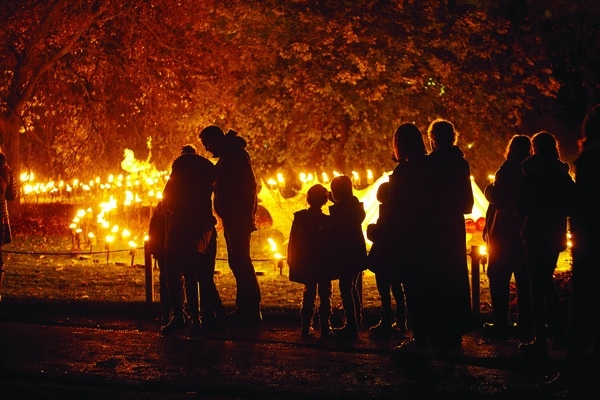 • Christmas at Kew kicks off tonight with the garden landscape once again transformed into a spectacular light and sound show. Highlights from this year’s display include a ‘Field of Light’ by Brighton based artists Ithaca which reaches across the landscape towards the newly restored Great Pagoda, a laser garden by Australian studio Mandylights, 300 illuminated origami boats floating on Kew’s lake in an installation by Italian artists Asther & Hemera, ‘Firework Trees’ lit up by explosions of coloured light, a seven metre tall Cathedral of Light, a fire garden and “enchanted walkway” of giant glowing peonies and papyrus by French artists TILT and, of course, the famous Palm House finale which brings the giant glasshouse to life with a show featuring criss-crossing laser beans, jumping jets of light and kaleidoscopic projections playing across a giant water screen. Santa and his helpers can be found along the trail and there is a festival fairground with a Victorian carousel as well as food and drink at a range of stalls in Victoria Plaza. Runs from 5pm on select dates until 5th January. Admission charge applies. For more, head to www.kew.org/christmas. PICTURE – Below: The Fire Garden/Raymond Gubbay Ltd (RBG Kew). • All 12 surviving portraits of celebrated 18th century artist Thomas Gainsborough’s daughters have been brought together for the first time in a major new exhibition at the National Portrait Gallery. Gainsborough’s Family Album depicts the development of the Gainsborough girls from playful young children to fashionable adults with highlights including The Artist’s Daughters chasing a Butterfly (c1756) and The Artist’s Daughters with a Cat (c1760-1) as well as the little seen double full-length of Mary and Margaret Gainsborough as young women (c1774). More than 50 works are included in the display and a number have never been seen in the UK before. The latter include an early portrait of the artist’s father John Gainsborough (c 1746-8) and a drawing of Thomas and his wife Margaret’s pet dogs, Tristram and Fox. The display traces the career of the artist (1727-88) who, despite his passion for landscapes, painted more portraits of his family members than any other artist of the time or earlier. Together they form an “unusually comprehensive” visual record of an 18th century British kinship network, with several of its key players shown more than once at different stages of their lives. The exhibition runs until 3rd February. Admission charge applies. For more, see www.npg.org.uk. • Artist William Heath Robinson and his fascination with domestic life is the subject of a new exhibition opening at the Heath Robinson Museum in Pinner on Saturday. Heath Robinson’s Home Life centres on the fact that from about 1930 onwards, the artist’s humour was centred on domestic life including the construction of his house, ‘The Gadgets’, at the Ideal Home Exhibition of 1934 and the release, from 1936, of the first of his ‘How to’ books, How to Live in a Flat. The display features an early series of “Ideal Home” cartoons published in 1933 and rare photographs of ‘The Gadgets’ under construction at the Ideal Home Exhibition. There’s also original artwork from How to Live in a Flat and examples of a set of nursery china that he designed for a Knightsbridge department store in 1927. Runs until 17th February. Admission charge applies. For more see www.heathrobinsonmuseum.org. • A new exhibition has opened at the British Library in Kings Cross to mark the 150th anniversary of the publication of Alice’s Adventures in Wonderland. The free exhibition explores the story of how the tale came to be written and features Lewis Carroll’s handwritten manuscript of Alice’s Adventures Under Ground (complete with 37 illustrations by Carroll) as well as an entry from Carroll’s diary in which he relates how he first came to tell the story to Alice Liddell and her sisters on the “golden afternoon” of 4th July, 1862. 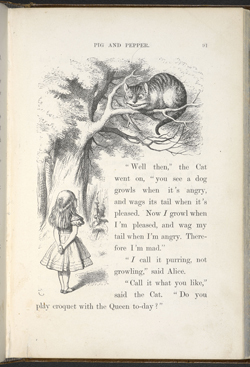 Other highlights include two first editions of Alice’s Adventures in Wonderland with illustrations by Sir John Tenniel (including the suppressed first edition; suppressed because Carroll and Tenniel were unhappy with the quality of the illustrations), the first movie adaption of the story – a 1903 silent film, early Alice memorabilia, and three new computer game concepts. The exhibition, which runs until 17th April, is accompanied by a series of events and a pop-up shop. For more, see www.bl.uk/events/alice-in-wonderland-exhibition. PICTURE: Sir John Tenniel’s illustration of Alice and the Cheshire Cat from the 1866 edition of Alice’s Adventures in Wonderland by Lewis Carroll © The British Library Board. • An exhibition featuring more than 100 photographs by celebrated 19th century photographer Julia Margaret Cameron opens at the V&A on Saturday to mark the bicentenary of her birth. The display at the South Kensington museum offers a retrospective of her work and looks at her relationship with the V&A’s founding director Sir Henry Cole who presented the only exhibition of her work during her lifetime in 1865. Her relationship with the museum goes back to the very start of her work – within two years of being given a camera by her daughter she was selling and giving photographs to what was then the South Kensington Museum while, in 1868 she was granted the use of two rooms at the institution to use as a portrait studio, becoming the museum’s first artist-in-residence. The exhibition features original prints acquired from Cameron as well as a selection of her letters to Cole, his 1865 diary, the first photograph identified as being of her studio and a variety of her portraits in which family, friends and servants posed as characters from Biblical, historical and allegorical stories. The free exhibition runs until 21st February. For more, see www.vam.ac.uk/juliamargaretcameron. • The influence of the British Empire on art over the past 400 years is the subject of a new exhibition which opened in Tate Britain’s Linbury Galleries yesterday. Artist and Empire will showcase art from across the empire – including the British Isles, North America, the Caribbean, the Pacific, Asia and Africa – and features some 200 paintings, drawings, photographs, sculptures and artefacts. These include paintings by the likes of George Stubbs and Anthony Van Dyck through to Indian miniatures, Maori objects, and the works of contemporary artists such as Sonia Boyce and Judy Watson. Runs until 10th April at the Milbank gallery. The exhibition is free. For more, see www.tate.org.uk.